Top 7 Tips for Relaxed Hair! Yes, we said it, relaxed hair. Of course there's an abundance of tips and tricks out there for ladies rocking natural hair, and we totally endorse whatever makes you and your head happy. But, we also want to acknowledge those who like the relaxed look and show it can be long, and healthy, too. Relaxing the hair is fine, but just like having natural hair, you have to take care of it. Getting relaxers too often can be overly stressful on your hair and cause damage. You may want to keep the straight look as long as possible, but there are various ways to get around the new growth urging you back into the salon chair. You can braid the hair while wet for a wavy look, or do roller sets to give yourself some variety. Spread out your relaxers as long as possible. With regular washings and alternative styles, you can make it an extra few weeks. Give it a try! If your hair is exposed to chemicals--relaxer, color, etc.--you are exposing it to dryness as well. To keep damage at bay, use a protein conditioner, like Nexxus Emergencee as well as a moisturizing conditioner, like Hair by Tippi Shorter Smoothing Conditioner. These products, and others like them will keep your hair from breaking and protect it from the damage it could encounter. Leave-in conditioners are great too, so be sure to have one in your arsenal. When conditioning, be sure to separate the hair into sections to apply, and even comb it through. This will ensure you don't miss any spots! 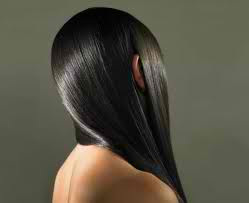 Relaxed hair, and even natural hair, can often experience unwelcome shedding. There's a cure. Pour about a cup of black tea over your hair after washing. Rinse the tea out, then condition. Black tea has caffeine which stimulates the hair follicles, but also strengthens them to keep the hair from shedding. It may sound strange at first, but surely it's worth seeing the results! 4. Dry on cool or warm settings, rather than hot. Many of us are ready to get on with the hair care process and if you're washing it at home, this is usually the case. Sure, the hot setting on your dryer will work faster, but it is not safer or better for your hair. After applying your leave-in conditioner, let your hair air dry for a while before applying the blow dryer. Then, you can use a lower setting, and minimize the heat exposure to your locks. It may call for a bit more of your time, but again, it's worth it. 5. Minimize and protect heat exposure. As just mentioned, you want to use lower heat settings when blow drying. When styling with hot tools like flat irons or curlers, you should not only use a ceramic-made tool, but protect your hair with a heat-guarding product as well. Silk Therapy by Biosilk is a great option, and again, we love the Hair by Tippi Shorter brand. These products will protect your hair against heat damage, and make it stronger. Also, limit your use of hot irons. If you find rollers hard to sleep on, pin curls are your friend! They give the same kind of curl and you can sleep easily. 6. Don't get too product-happy. Sure, we've given you some suggestions on products to use and endorsements of our faves, but you never want to apply too much of anything to your hair. Too much can weigh the hair down and block the hair shaft. This stunts growth and makes the scalp unhappy. Look for light products and absolutely avoid products with alcohol in the ingredients. It will dry your hair and can counter your conditioning. Check ingredients before you buy! Knowing your own hair is probably the most important tip we can provide. Maybe your hair doesn't respond well to any chemical, regardless of the way you take care of it. Or, maybe natural is not for you, and a relaxer is helpful to your hair health. Never feel pressured to style one way or the other, but make your style a priority. We all have our own look, so take the time to figure it out and go for it. We also highly recommend having a stylist who makes hair care and healthy hair a priority--not just styling. Having a great stylist will make things easier for you when taking care of your hair at home. Hopefully these tips will be helpful to you, and if you have others, please share them! All the best with your healthy hair journey. **We want to give a special shout out and thank you to Ms. Bukola Bello for contributing some of these wonderful tips. She's not only a great legislative lobbyist, but she has fabulous, healthy, relaxed hair!